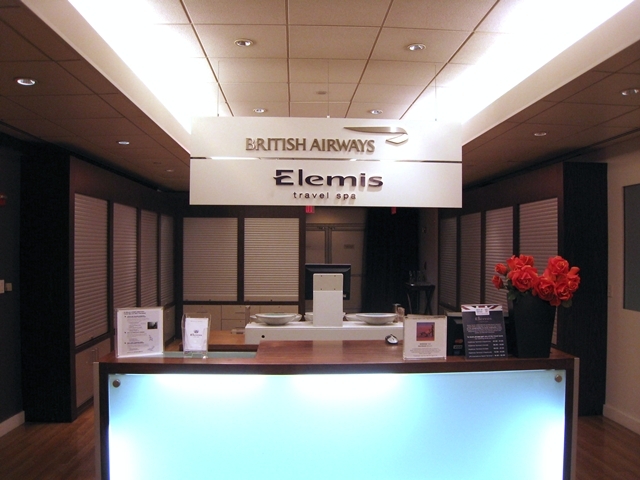 This review of the British Airways Galleries Lounge at JFK Airport is the first in a trip report including Cathay Pacific Business Class and First Class to Hong Kong and Business Class to Bali, plus reviews of luxury hotels and dining in Hong Kong and Bali. I checked in for my Cathay Pacific flight to Hong Kong online, but decided to also go to the regular airport check-in to verify that I’d be able to carry on my suitcase, as it's about the largest rollaway size that can be permitted. The agent said it wouldn’t be since I was in business class (though it would have been a problem for economy) and printed out a boarding pass and an invitation to the British Airways Galleries Lounge. Because it was late at night, the priority security line was closed, but there was practically no wait anyway for security. 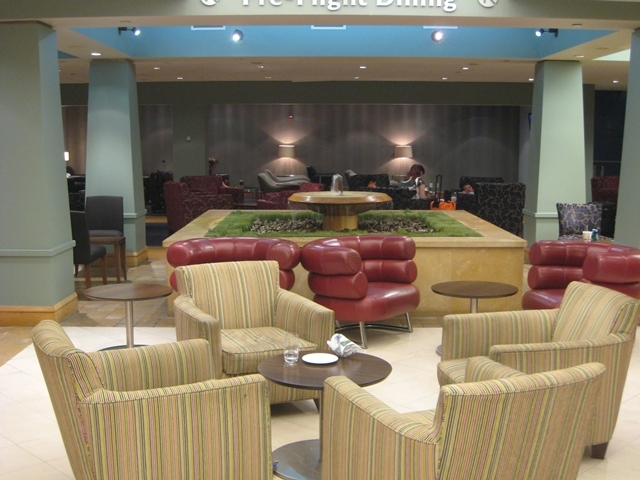 After clearing security, an escalator led up to a mezzanine, then a sharp left and another escalator led up to the British Airways Galleries Lounge (which has been renamed from Terraces). There are two sections, one for First on the left (access for British Airways First, oneworld Emerald when flying oneworld, or booked into J, U, F or Z on a oneworld transcontinental flight) and the other on the right for Business Class. I left my suitcase in the luggage area since I had nothing of any great value in it, and walked into the main part of the lounge and towards the refreshment area to make myself some tea. For a British Airways lounge, I would have expected a slightly better tea selection, but perhaps that’s on the First Class side J The food offerings were fairly minimal—a variety of packaged dry snacks, whole fresh fruit (apples, pears, bananas), some chilled packaged cheddar and Monterey jack cheeses, and Danone yogurt. Probably the best thing there was a passionfruit mint infused drink that was worthy of a nice spa. Highly recommended, especially over the more usual drink offerings. I plugged in my laptop to get some work done, and the network came up immediately, it wasn’t necessary to enter a password. It wasn’t the fastest WiFi, but it got the job done. There’s also a business center with computers, and there were plenty of terminals available when I was there, probably because we were the last flight of the night. There's also more seating in front of the Elemis Spa, which was closed when I was there. There are shower rooms, but by the time I discovered them they were either occupied or locked down for the night, so I didn’t get to take a picture of the inside. 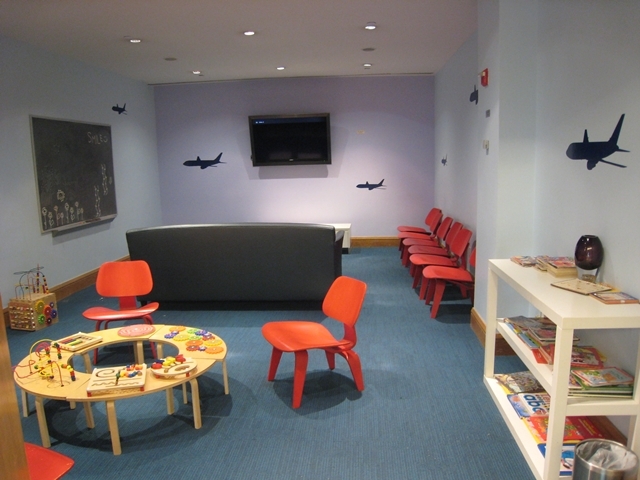 There’s also a kids’ playroom. The location of it does seem rather odd to me, since it’s by the spa (hmm, some noise from boisterous children to accompany that massage, anyone?) but maybe the spa treatment rooms are soundproofed. 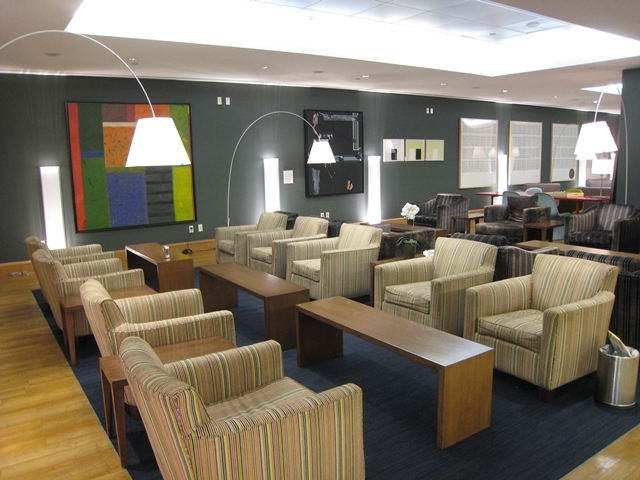 Verdict: All in all, a very solid business class lounge after its fairly recent refresh, and better than most U.S. business class lounges I’ve seen. 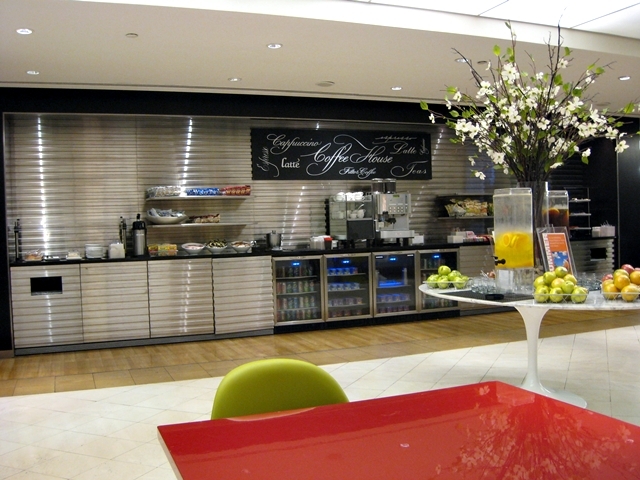 No massage chairs, sushi or Haagen Dazs ice cream as the Tokyo ANA Business Class Lounge has, but that’s the U.S. and UK for you—not terribly focused on food, at least where airlines are concerned.